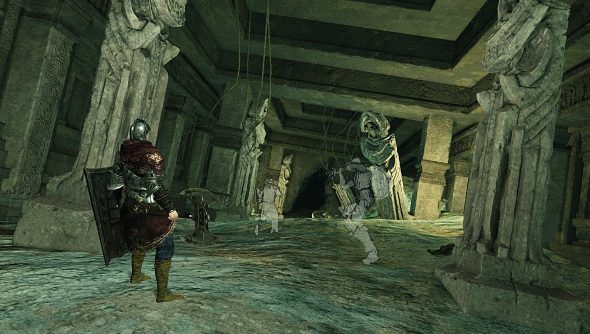 Ahead of the launch of Dark Souls 2’s first slice of DLC, Crown of the Sunken King, which is due out tomorrow, From Software’s slapped a massive update on the game. Really bloody massive. Some of the changes are rather sweeping, such as health recovery items not longer being usable in PvP, tweaks to continuous attacks and corrections to damage. If you’re wondering if now is a good time to dip into the game, take a gander at my Dark Souls 2 review. Or I could just tell you right here that you should get it. Tomorrow’s DLC is the first part in a trilogy, opening up new areas and challenges for players to die over and over and over again in. The goal: nicking a bunch of crowns. That’s right, it’s a heist with three of King Vendrick’s crowns as the target. The second DLC, Crown of the Iron King, launches on August 26th, while the final installment can be played from September 23rd. You can take a gander at the gargantuan list of changes, fixes and updates added in 1.08 over on the official site. Will you be going back to Drangleic tomorrow?